Which Automation Tool Is Right for My Use Case? List the tools included in Lightning Flow. Describe the tools available for automating guided visual experiences. Describe and compare the tools available for behind-the-scenes automation. Describe the tools available for approval automation. No matter whether they’re buying movie tickets, paying bills, or changing restaurant reservations, if a customer is interacting with a company, they expect a seamless, personalized experience. For example, when a customer needs to replace her credit card, the average service agent needs to know a bunch of things. Is it damaged, lost, or stolen? If it’s stolen, is she worried about recent transactions? Where should we send the new card? Serving a customer in this situation and gathering and maintaining related data can involve separate systems with varying degrees of complexity. Design and build an end-user experience. 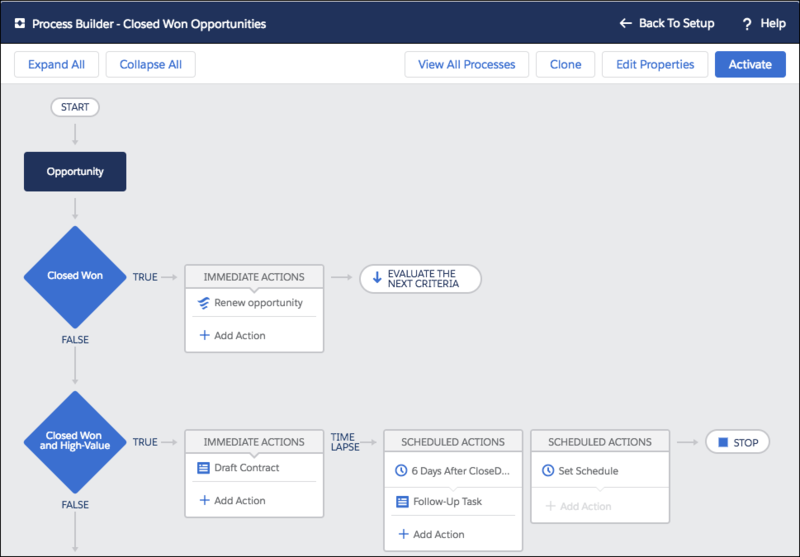 Included in Lightning Flow are two point-and-click automation tools: Process Builder, which lets you build processes, and Flow Builder, which lets you build flows. Lightning Flow is the name of the product. Process Builder and Flow Builder are the names of the tools. Use Process Builder to make processes; use Flow Builder to make flows. Later, we talk about when to use each tool, but for now here’s a sneak peek at what business processes look like in each tool. With these two tools, Lightning Flow makes it easy for you to do the following. Create a guided tutorial or wizard with screens. Flow Builder includes several out-of-the-box screen components, like text boxes, radio buttons, and file-uploads. If you need more than what’s offered, add custom Aura components to your screens. Set up automated tasks and processes. 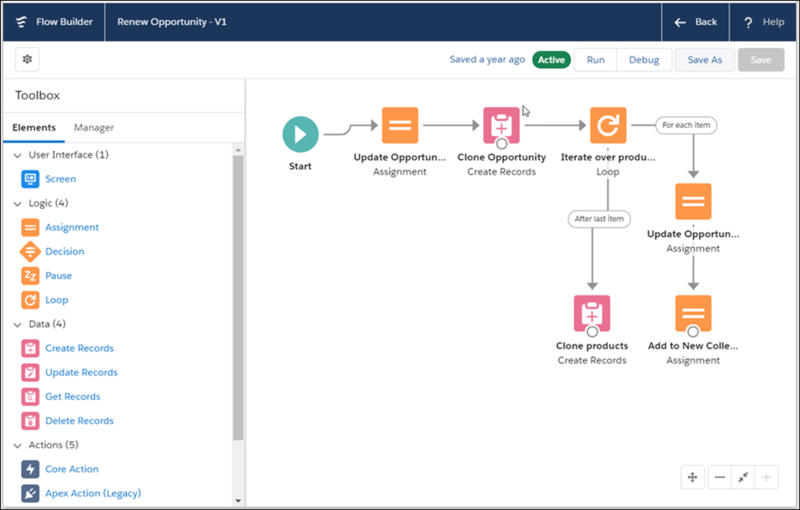 Declaratively configure logic and actions for your business process with either Process Builder or Flow Builder. If needed, you can build custom Apex code to fill any functional gaps. Connect to external systems. Communicate changes between your Salesforce org and your external systems with platform events. Process Builder and Flow Builder let you respond to and send platform event messages. In addition, Flow Builder can retrieve data from third-party systems with External Services. Add automation to your pages and apps. Make sure your behind-the-scenes processes start when the right action happens, whether that’s when records change or when users click a particular button. Once you build guided visual experiences, add them to Lightning pages, Community pages, the utility bar in your Lightning apps, and more. Reuse what you build. In Flow Builder, any flow can be used as a subflow. In Process Builder, create an invocable process to reuse that process’s logic or actions in other business processes. When it’s all said and done, a process-driven experience isn’t backed by only one process. It’s a combination of all the business processes in your org that can impact your customer. Each business process typically falls into one of these camps. Behind-the-scenes automation Business processes that get all the necessary data from your Salesforce org or a connected system. In other words, user input isn’t needed. One of the hardest things for an admin or a developer to figure out is when to use what tool for the job at hand. In general, it’s best to start with declarative, no-code tools and work your way up to code solutions. Automate a guided visual experience. Add more functionality for a behind-the-scenes process than is available in Process Builder. Use Flow Builder to build the more complex functionality and then call that flow from a process. Then call the resulting flow from the process. Start a behind-the-scenes business process when a user clicks something, like a button. For example, when an opportunity is won, your company wants a renewal opportunity to be created automatically. As you see later in this module, you can build parts of that use case as a process, but the rest has to be built in a flow. Use Apex when you need more functionality than is available in Process Builder or Flow Builder. Build the more complex functionality as invocable Apex methods. Then call the resulting Apex as an Apex action in the process or as an Apex action element in the flow. Now, let’s see these principles in practice with a few sample scenarios. Wait. What’s an Approval Process? Surprise! We snuck another tool in here. Approvals isn’t included in Lightning Flow, but it offers a declarative way to automate something that Lightning Flow doesn’t cover. That said, Lightning Flow does support automating how a record gets submitted for approval. You’ll learn more about Approvals later in this module. If you’re not already using Workflow, you should check out Process Builder and Flow Builder first. They have more features and can do more things. Plus, Flow Builder includes all-new functionality for behind-the-scenes automation. You can learn more about Workflow by visiting Salesforce Help. Salesforce Help: Which Automation Tool Do I Use?